This sounds delicious and easy. I cannot wait to try it out. I have never had a dessert with sweet potatoes, so this would be interesting to taste. That’s a great way to use sweet potatoes. Almost healthy. 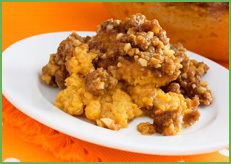 I love eating sweet potatoes and this recipe looks SO GOOD. I have to try it!